Today’s piece is another finger rosary. 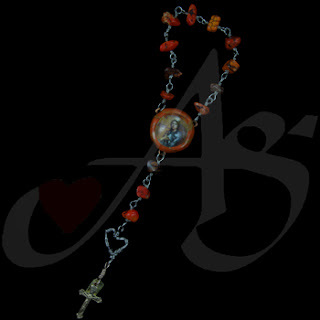 This rosary is made with brass and nickel wire, and orange howlite beads. 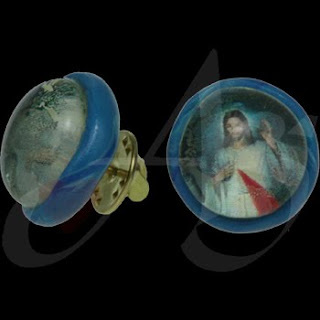 The centerpiece of this finger rosary is an image of St. Joan of arc, underneath a glass cabochon. This piece is currently available! If you would like this piece, a similar piece, or any unique piece of jewelry; contact us! Don’t forget to stop by our Facebook page, Google+ page, Twitter, or our website for more specialty devotionals and pieces for jewelry. Today’s piece is a finger rosary. This finger rosary is made with brass wire and tiger eye beads. The centerpiece is an image of Fr. Solanus Casey underneath a glass cabochon. This piece is currently available! If you would like this piece, a similar piece, or any unique piece of jewelry; contact us! Don’t forget to stop by our Facebook page, Google+ page, Twitter, or our website for more unique devotionals and pieces of jewelry! Today’s piece is a finger rosary. This finger rosary is made with purple amethyst stones and a St. Joan of Arc centerpiece. This piece is currently available. If you would like this piece, a similar piece, or any unique piece of jewelry; contact us! Don’t forget to stop by our Facebook page, Google+ page, Twitter, or our website for more exquisite pieces of jewelry! Today’s piece is a finger rosary. This finger rosary is made with gold agate stone nuggets. The centerpiece is made by an image underneath a glass cabochon. This finger rosary is devoted to St. Francis. This piece is currently available. If you would like this piece, a similar piece, or any unique piece of jewelry; contact us! Don’t forget to stop by our Facebook page, Google+ page, Twitter, or our website for more unique pieces of jewelry! Today’s piece is a finger rosary. 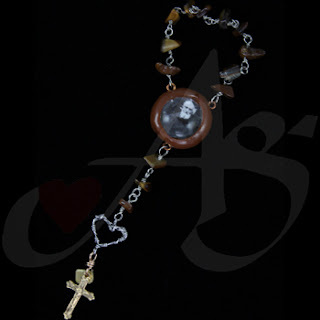 This finger rosary is made with agate beads, and a centerpiece of Mary and Jesus underneath a glass cabochon. This piece is currently available! If you would like this piece, a similar piece, or any unique piece of jewelry; contact us! Don’t forget to stop by our Facebook page, Google+ page, Twitter, or our website for more pieces of jewelry! Today’s piece is a pin. This pin is made with brass and nickel wire. He head of the butterfly is made with one green glass seed bead, and the body is made of four clear glass seed beads. Get ready for summer with our wonderful bug pins! This piece is no longer available. If you would like a similar piece, or any unique piece of jewelry; contact us! Don’t forget to stop by our Facebook page, Google+ page, Twitter, or our website for more splendid pieces of jewelry! Today’s piece is a brooch. 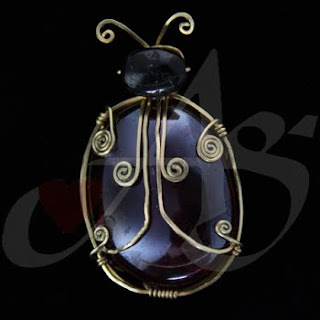 This is a ladybug made by brass wire wrapped glass cabochon and a piece of onyx for the ‘head’. This piece is no longer available. If you would like a similar piece, or any unique piece of jewelry; contact us! Don’t forget to stop by our Facebook page, Google+ page, Twitter, or our website for more fabulous pieces of jewelry! Today’s piece is a tie chain. This tie chain is made of hand twisted brass wire, with buffalo bone and glass beads on the bottom. The loop on the top attached toa button underneath the tie, and the bone piece, lays on top of the tie to weith it down, this eliminates any piercing of the tie! This piece is currently available. If you would like this piece, a similar piece, or any unique piece of jewelry; contact us! Don’t forget to stop by our Facebook page, Google+ page, Twitter, or our website for more fabulous pieces of jewelry! Today’s piece is a zipper pull. 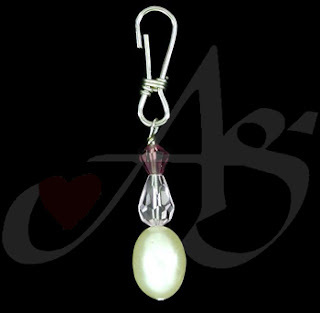 This zipper pull is make with an oval white faux pearl, and two faceted Japanese crystals. This piece is a wonderful accessory for those hard to grab zippers on jackets, purses, totes, or wherever a zipper is hard to find or simply needs accessorizing! This piece is currently available, and waiting for you! If you would like to this piece, a similar piece, or any unique piece of jewelry; contact us. Don’t forget to stop by our Facebook page, Google+ page, Twitter, or our website for more wonderful pieces of jewelry! Today’s piece is a necklace. This necklace is made with pink rattail and silver colored ribbon. The two pieces are twisted and knotted together to make an adjustable clasp. The pendant is attached to the ribbons with a brass loop. 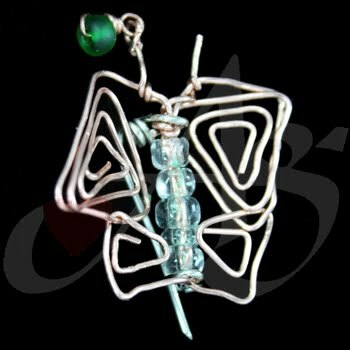 The pendant is made of nickel wrapper copper. The copper is hand stamped from sheet metal. This piece is currently available! If you would like this piece, a similar piece, or any unique piece of jewelry, contact us! Don’t forget to stop by our Facebook page, Google+ page, Twitter, or our website for more unique pieces of jewelry. Today’s piece is a beverage charm set. This set is made with nickel and brass sheet metal, hand punched into the washer shape. The hand-blown glass lamp-work beads were then adhered to the sheet metal pieces with copper wire. This piece will add a fun atmosphere to any of your celebrations! This piece is currently available! If you would like this piece, a similar piece, or any unique piece of jewelry; contact us! Don’t forget to stop by our Facebook page, Google+ page, Twitter, or our website for more great pieces of jewelry! If you would like this piece, a similar piece, or any unique piece of jewelry; contact us! Don't forget to stop by our Facebook page, Google+ page, Twitter page, or our website for more fantastic pieces of jewelry! Today’s piece is a pair of earrings. These earrings are made from brass, copper, and nickel. The brass and copper pieces were hand cut from pieces of sheet metal, and the copper was hand stamped, clipped and rolled from sheet metal to attach the two circles. This piece is currently available! If you would like this piece, a similar piece, or any unique piece of jewelry; contact us! 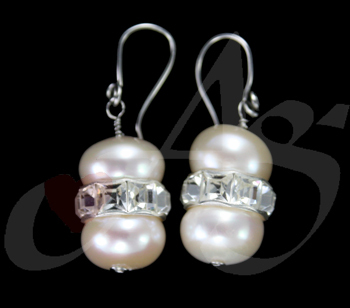 Don’t forget to stop by our Facebook page, Google+ page, Twitter, or our website for more exquisite pieces of jewelry. 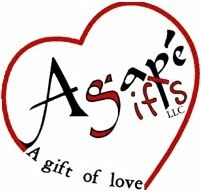 Agape Gifts will be showing at the Sacred Heart of the Hills Lenten Fish Dinners. The Parish Hall is located at 3400 S. Adams Rd, Auburn Hills, MI. We hope to see you there! Up to 50% of the profits from this show will be returned to the Knights of Columbus to fund organizations in the Metro-Detroit area. If you would like to attend, please email us for more information. Agape Gifts will have a display at the Right to Life of Michigan Teen Fashion Show at Sts. Cyril and Methodius Parish. This event is open to the public, and for more information, please email us. We hope to see you there! Up to 50% of the profits from this show will go towards Right to Life of Michigan. Today’s piece is a rosary bracelet. This rosary bracelet was just made yesterday, actually. 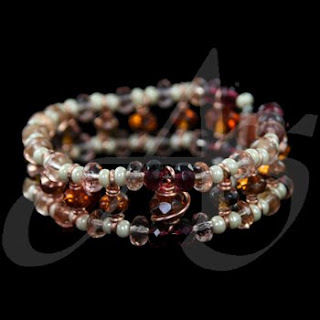 It features Chinese crystals in light pink, champagne red, and amber. The Hail Mary beads are the amber crystals, and the Our Father beads are the copper wrapped larger ember beads. The white spacers separating each of the Hail Mary beads are made of buffalo bone. This piece features an Agape Gifts’ original copper clasp. This piece is currently available! If you would like this piece, a similar piece, or any unique piece of jewelry; contact us! Don’t forget to stop by our Facebook page, Google+ page, Twitter, or our website for more stunning pieces of jewelry! Today’s piece is a bracelet. 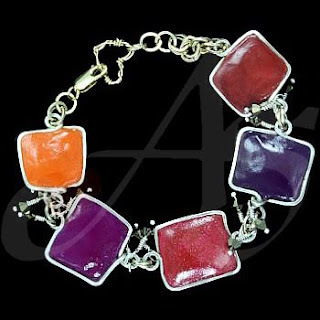 This bracelet has been shown before, as our piece of the day, but here at Agape Gifts, this one of our favorite pieces. Each of the squares are hand made from a gold 14/20-karat frame and filled with polymer clay. Between each of the squares are gold colored, aurora borealis plated, Swarovski crystals. This piece is currently available. If you would like this piece, a similar piece, or any unique piece of jewelry, contact us! Don’t forget to stop by our Facebook page, Google+ page, Twitter, or our website for more fabulous pieces of jewelry. Today’s piece is a pair of earrings. These earrings were just finished over the weekend, and are definitely fun and creative! The base of this piece is a large nickel circle, hand punched from nickel sheet metal. The smaller ring on the bottom is textured copper, hand cut from a textured sheet of copper. The copper disk is attached to the nickel base with nickel wire. This piece is currently available! If you would like this piece, a similar piece, or any unique piece of jewelry; contact us! 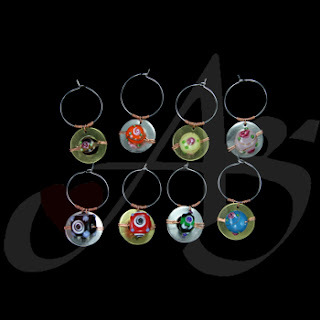 Don’t forget to stop by our Facebook page, Google+ page, Twitter, or our website for more creative pieces of jewelry! Today’s piece is a pair of earrings. 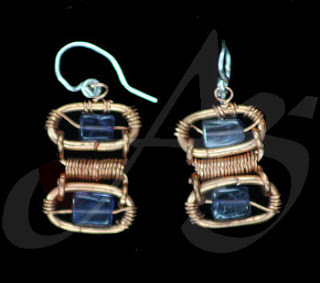 These earrings are made with copper wire and iolite ‘bricks’. 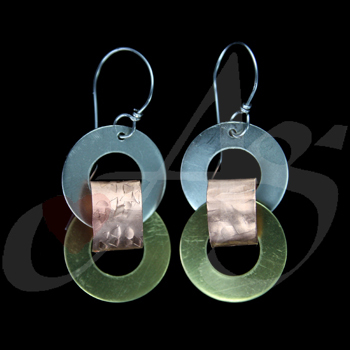 There are two gages of copper wire, to give the piece dimension. This piece also had a matching bracelet! These earrings are currently available! If you would like this piece, a similar piece, or any unique piece of jewelry; contact us! Don’t forget to stop by our Facebook page, Google+ page, Twitter, or our website for more amazing pieces of jewelry! Today’s piece is a pair of smartlinks. These smartlinks are similar to cufflinks, however they can be work on any shirt. Rather than purchasing multiple French-cuffed shirts and regular shirts, you can have the same cufflink flair on a regular shirt. Simple put the face through the button hole, and clasp the pin next to the button. This pair of smartlinks is made with an image of the Divine Mercy on blue polymer clay and is sealed with a glass cabochon. This piece is currently available! If you would like this piece, a similar piece, or any unique piece of jewelry; contact us! Don’t forget to stop by our Facebook page, Google+, Twitter, or our website for more elaborate pieces of jewelry. Today’s piece is a pair of earrings. 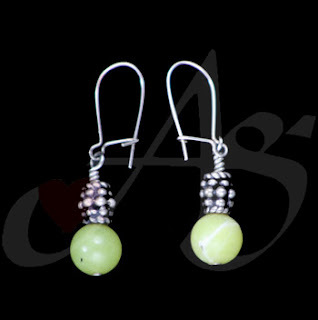 These earrings are made with sterling silver and jasper. The round green beads are green jasper, and the “knotted” beads are a hand-oxidized sterling silver. Hand oxidized means there is the black pygment rubbed into the bead, giving it dimension. This piece is no longer available. If you would like a similar piece, or any unique piece of jewelry; contact us! Don’t forget to stop by our Facebook page, Google+ page, Twitter, or our website for more distinctively unique pieces of jewelry!